The second Maoriland Film Festival kicks off on Tuesday 24th March, finishes Sunday 29th March. Last year close to 5,000 attended screenings of 48 short films and 11 feature films. This year is even more ambitious with 120 short films, 10 feature films and 10 documentaries from USA, Canada, South Africa, Europe and Aotearoa. An ambitious filmmaking competition for school children aged 11-17 has attracted entrants from all over the country, ensuring a fertile breeding ground for future filmmakers. Best of all, we have a large number of indigenous filmmakers who, having heard of last year’s festival success, want to participate. There is a team of women filmmakers from Canada who have just had their short films made as a collective screen in Berlin as part of the NATIVe Cinema programme of the Berlinale. The director of the Toronto ImagiNATIVE film festival is coming, as is a director from the American Sundance film festival. Maoriland was modeled on Sundance which was started 23 years ago by Robert Redford in a town the same size as Otaki. Maoriland is an opportunity to watch films and communicate directly with the filmmakers. In an increasing homogenesised world, it’s great to see people seeking stories that highlight homeland, language and culture. Where better in New Zealand than Otaki to celebrate NZ’s indigenous cinema success? What better chance to rub shoulders with the producers, actors and creators of such classics as Boy, The Dark Horse, What we do in the Shadows, The Pa Boys and The Dead Lands? Encompassing three venues: Civic theatre, Nga Purapura, Hadfield Hall, with special screenings at Raukawa marae and Rangiatea church, we are in for five days of film, culminating in a Red carpet Party in the Civic theatre on Saturday night. Film sessions cost a modest $6. You can book online via the Maoriland Film Festival website or purchase tickets to all events from the Civic Theatre during Festival week. Nga Purapura seats 600, Civic theatre 250, Hadfield Hall 200. Some films will be booked out, so it’s wise to check the programmes and book early. Film is about entertainment. It is also an artform, stimulating thought about life. The vision is to use native lens and iwi screens to bring the world’s cinema stories to Otaki. In the early 1920s Australian company Federated Feature Films Ltd proposed a New Zealand branch to produce feature films. A Mr Frank Moore visited on their behalf and suggested Otaki as a suitable place to establish a studio because of the town’s varied scenery and “potent actinic rays” (white light). The New Zealand Moving Picture Company (Māoriland Films) was established. In the six short months, Māoriland Films made three films: Otaki Gorge, Buller Lake, Otaki Maori Life, Historic Otaki and Charlie’s Capers, (a comedy starring a Charlie Chaplin impersonator). The dream for Otaki to be ‘The Los Angeles of New Zealand’s moving picture industry’ was fleeting, due to the lack of support facilities for film in New Zealand. Now, nearly one hundred years later a new dream will be realised. In 1985, Robert Redford did it for Park City, Utah. Every year Park City’s population of about 6,500 swells to 40,000 as filmmakers, the film industry and fans view movies from every corner of the planet at the Sundance Festival. Soon they’ll be doing it for Otaki’s Maoriland Festival. Action movie The Dead Lands is set in Aotearoa before the pākehā. James Rolleston (star of Boy) plays Hongi, the son of a Māori chief. After the massacre of his tribe, Hongi sets out into the forbidden Dead Lands, hoping to enlist the help of a legendary warrior (Lawrence Makoare, who will be here in person). Following its debut at the 2014 Toronto Film Festival, the film topped the NZ box office. Te reo with subtitles. A real Kiwi no. 8 wire production, the vision of Libby Hakaraia and Tainui Stephens, who have built international networks in the television and film industry over the past two decades. With some gentle prodding from filmmaking friends who wanted to see Aotearoa on the International Indigenous film circuit they decided to launch Maoriland. Now with the support of the hapu of Otaki and hardworking whanau including cousin Pat and his wife Tania the festival is preparing for double the audience numbers of last year. The festival is funded through an assortment of grants from local, national and government organisations. This year a range of local businesses have added their financial support by becoming Patrons and Friends of the Festival. Aiming for the stars, the aim is for MFF to become the largest indigenous film festival in the Southern hemisphere. And why not? Yet another Otaki event poised for recognition on the world stage. Ka nui te pai MFF! 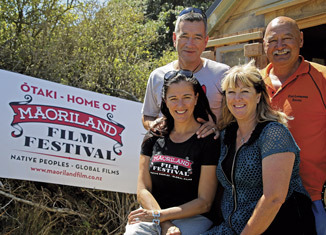 The Otaki Mail is proud to be a Friend of the Maoriland Film Festival.